You guys may have noticed that I've been somewhat absent this month. One of the things I've been working on is this project I'm showing you today. You know that I don't tend to participate in a lot of blog home tours, contests, and other bloggy type events. This isn't really a big decision on my part not to do these things, but deadlines rather freak me out and I try to freak out as little as possible. In a nutshell, The Fab Furniture Flippin' contest pits 30 fab furniture flippers against each other to out wit and out last the other bloggers and then fight to the - oh wait . . . that's not true . 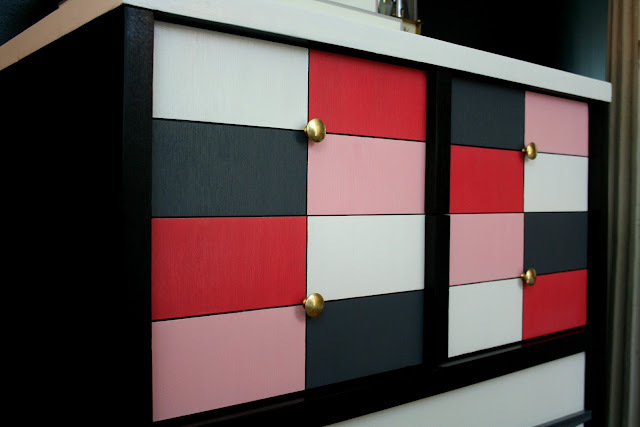 . .
Actually 30 of us, plus two monthly hostesses, remake a piece of furniture based on a theme. This month's theme was "geometric". In addition to our blogger hosts, we also have a business sponsor for each months contest. This month's sponsor is General Finishes. They provided each of us participants with a can of our choice of product to complete our project with. And then, when the judges pick a winner, General Finishes provides a prize for the winner! I say "pick me, pick me, PICK ME!!!!" I like to say that because it reminds me of early grade school, when you want so badly to be picked that you practically yank your shoulder out of socket trying to have the highest raised hand. When that doesn't work, you cross one of your legs under you so can elevate just a little bit higher. 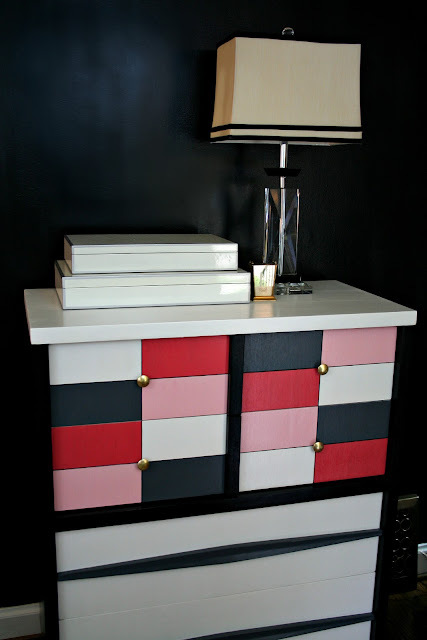 So you may be wondering what I decided to do for this little geometric fab furniture flippin' contest. When I think geometric furniture design, I think 1950's - and I had just the piece. 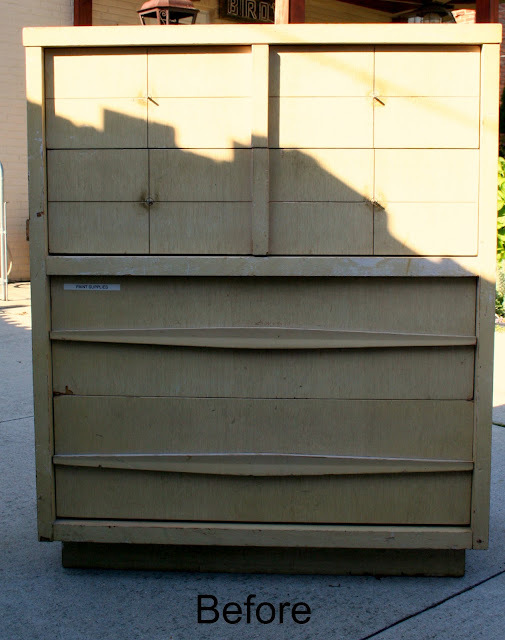 It was storage for all my paint supplies, screws, nails, and various hardware, electrical supplies, and plumbing supplies. I even had them labeled. 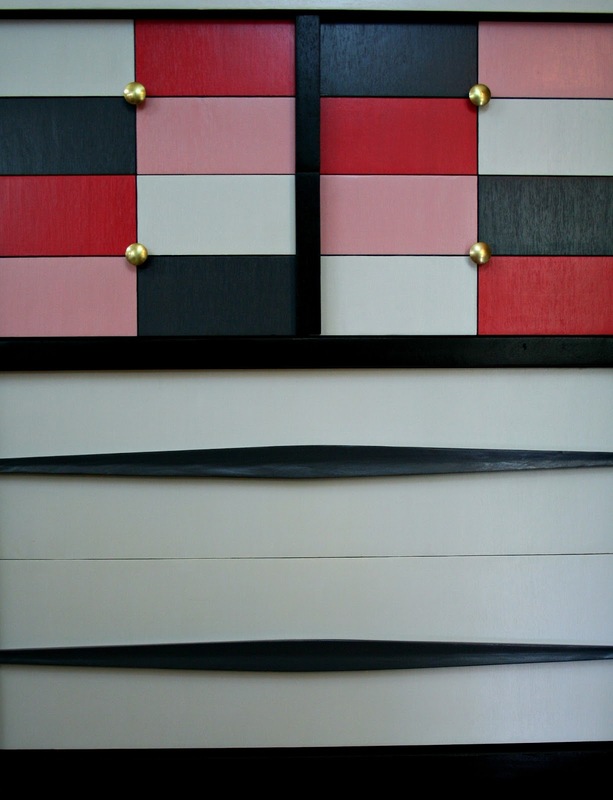 But the sheer rectangleness and 8 little rectangles on each of the top two drawers totally say 'geometric' to me. So I transferred everything into various containers and wiped off 35 years of basement and garage dust and brought it upstairs. This chest is one FINE example of 1950's, 'we just got married and need bedroom furniture' furniture. It belonged to my parents. There was a headboard that disappeared long ago, and there is a dresser and mirror which I will be bringing home with me the next time I go to Oklahoma. I'm not sure about any bedside tables. It only makes sense that they would have been part of the set. 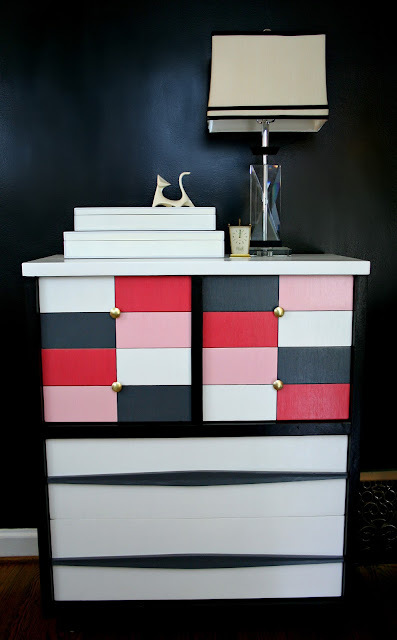 The best thing about these dressers, and I'm sure the reason that they are still alive today, is that the drawers in these suckers are HUGE! Just put them in the garage and they can hold years and years and years and years of pictures, school papers, sheet music, work papers, and any other abundance of things that you might want to put off getting rid of. Now both of them are empty and one of them has moved into the 21st century. Looking promising, don't you think? I sanded every square inch of it with my random orbital sander - first with 60 grit then with a finer grit. This construction of this piece was very interesting. 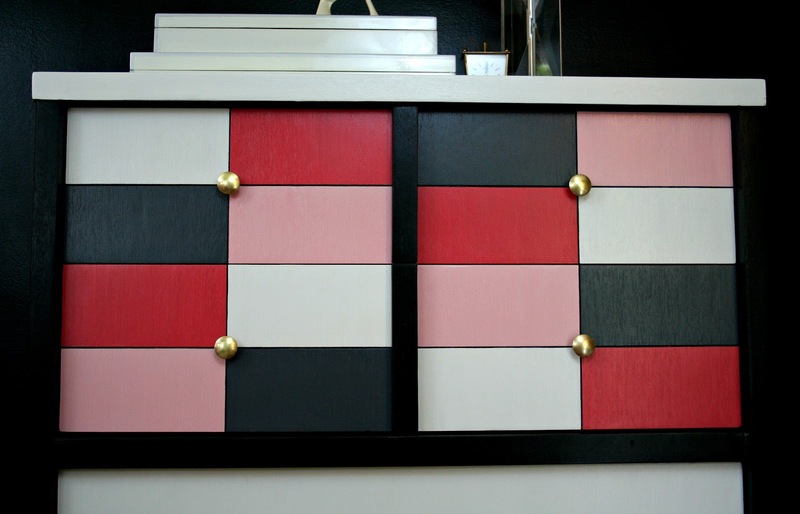 The decorative wood pieces on the fronts of the drawers came right off. That was nice, because it certainly is easier to sand a flat surface than a weird one. The veneer was different than any I had ever seen. There were two thin layers of wood over the whole piece. The top layer was extraordinarily thin and VERY porous with an extreme wood grain pattern. If I had sanded it down to where you could not feel the grain, there would be no veneer left. It was almost like pumice - except like wood grain. 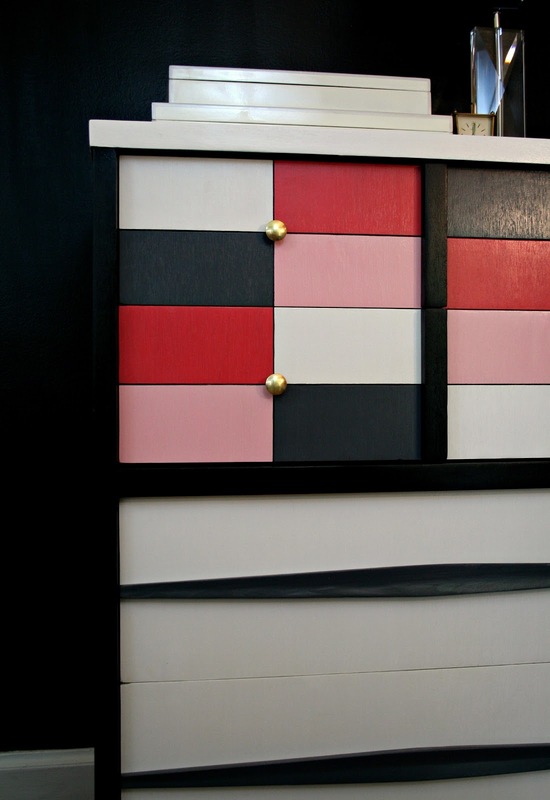 I used all General Finishes products to complete this dresser. The gray and black parts were stained with 2 coats of General Finishes gray and black Gel Stains. If you've never had a chance to work with gel stains you're missing out. I find them so much easier to work with than liquid stains. They are so easy to control. I was actually able to use the black stain on the small areas between the squares on the drawer fronts without bleed through. Whoa! the color on that picture is awful. Please ignore it. 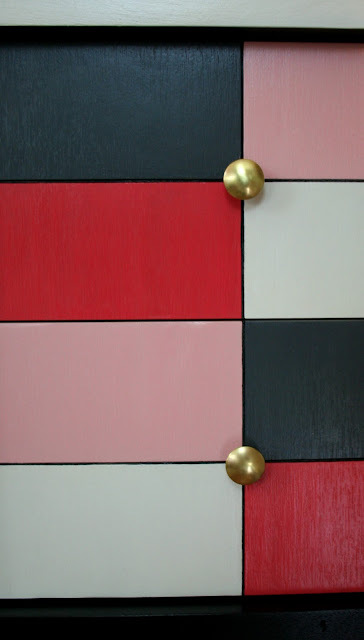 I used the General Finishes Milk Paint in Snow White and Coral Crush to paint the rest of the piece. The lighter pink was a mix of 8 parts Snow White to 1 part Coral Crush. I believe that I used 4 coats of the white and 3 coats of the pinks. The entire thing was coated with 3 coats of the High Performance Water Based Top Coat. 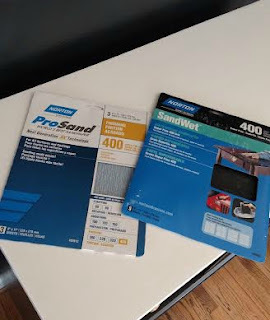 I used these sand papers to sand prior to the final coats of paint and then the final coat of top coat. The 400 grit is perfect for smoothing out a painted finish. I like to use a wet sand when I'm working with a top coat. Since most of you know that I paint almost exclusively with Chalk Paint and traditional milk paints, I want to add that 180/220 is fine for most Chalk Paint and milk paint projects. I do use the higher grits (400 or even 500) when I want a smooth modern surface with NO distressing. This is the original hardware and I love the way the brass looks with the colors. If I was made of money I would replace the bottom hardware (wooden handles) with a very long brass bar handle. I did price these out and very long brass handles are veeeeerrry expensive. So alas, I did not buy them. I think that the new hardware would give this piece a very clean, contemporary look. Since this is the first time I have used General Finishes products I want to let you know what I thought. I'm going to rate them on a 5 star scale - since that is what is used on their website. 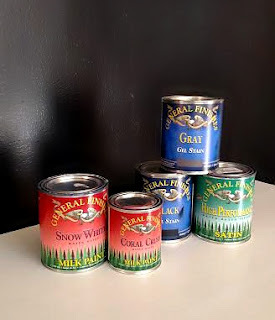 General Finishes Milk Paint - it is my understanding that this "milk paint" is not actually milk paint, but a water based acrylic. It did function much more like other water based acrylic paints that I have worked with (Paint Couture). Application is slightly different for this type of paint than it is for Chalk Paint so it took me a minute to adjust. 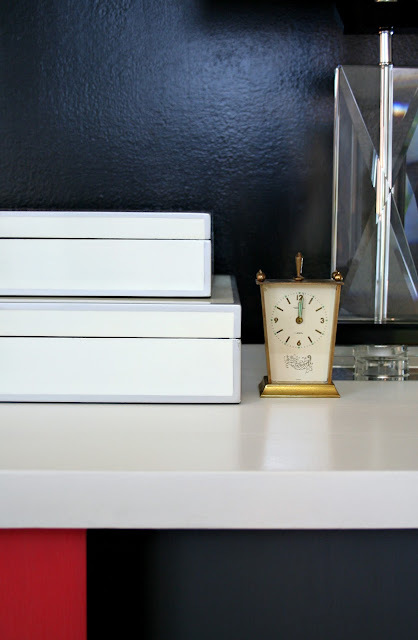 This was a great product for creating the modern finish I was looking for on this project. I have seen others use this paint for distressed finishes and I will use my leftover paint to evaluate how it works for that finish. For the purposes of this project I give the paint 5 STARS. General Finishes Gel Stain - I already told you how much I love gel stains. I particularly liked the black stain. I have used some black stains previously that didn't go completely black - pretty, but not black. This stain went black. Now I guess I will have to go back and do my other project over again! I give the gel stain 5 STARS. I would give it more, but well, that would be cheating. General Finishes High Performance Water Based Top Coat - You guys know I'm a big fan of the wax finish. You may not know how much I don't like a latex or poly finish. I'm rather a snob about it. And I considered waxing this piece. Let me say here that General Finishes Milk Paint does not require a top coat. But since the top of this piece is white I didn't want to risk having no finish at all. Plus I needed a finish over the stained areas. I have read several comments (like, a LOT) about what a good product the High Performance Water Based Top Coat is so I wanted to try it so I would know about it should I need to use a topcoat on a piece in the future. Before I used it I sanded the paint finishes and stained surfaces with the 400 grit dry sand paper. I rolled on 2 thin coats of topcoat, then wet sanded all surfaces and applied one more coat. I chose the satin finish (it comes in flat, satin, semi-gloss, and gloss) because I wanted a slight glow and a little bit more "slickness" to the finish. I'm very pleased with the way it looks now. Of course I can't judge how "high performance" it is because I've only seen it after one day. I'm going to give this product 4.90 STARS. Because I just can't give hard coats a 5. 5s are reserved for really good wax finishes. And of course, if I find that the finish is not durable, I will have to take off some points down the road. I'm pleased with the project as a whole and hope that I can find a happy buyer once I get the other dresser fixed up to coordinate. 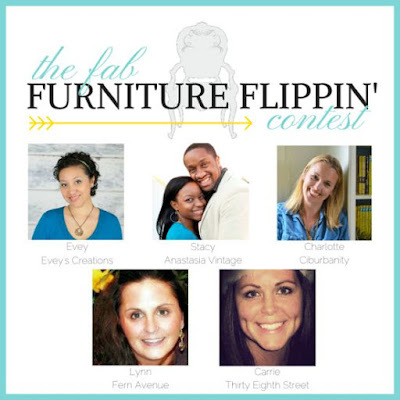 Now I want to introduce you to the ladies behind The Fab Furniture Flippin' Contest. Two of them are September's hostesses and I would love it if you would head over to see if the otheer contestants know their geometry! The Fab Furniture Flippin' Contest is open only to the entrants who have signed up through the group Facebook page. If you are an active, furniture flippin' blogger, and you'd like to participate in future contests, please contact one of the hostesses at info@fabfurnitureflippincontest.com to find out how! I know this post was long, but thanks for hanging in there my friend! If all goes well, in less than two days I'm going to be able to show you my new living room! So you will be able to see what I've been up to this month! You sure did a lot of work just getting that piece upstairs to paint. Now show us the after of where you stashed everything, lol. The piece looks fantastic. You really did a great job. Love the color mix you used. You did a great job on this piece. It looks awesome. Wonderful take on geometric design, I Love MCM and this one turned out stunning, Very classy! I saw this when you posted it on Instagram and it amazed me. The retro ceramic cat is from MakingClayMemories on Etsy.com. She uses vintage molds - I love her greyhound. What an outstanding transformation. I have a room where this would be perfect! I think you did a fabulous job! What a huge difference and will go into any room!! Awesome!